The shoreline of one of Fiji’s 300 or so islands, as seen from the air transfer to Kokomo Private Island Fiji. We all dream of powder-soft, palm-fringed beaches and crystal clear seas, but in the South Pacific, these are par for the course. After the opening of Vatuvara and a clutch of other next-level properties, Michael Paterniti finds out what it takes to create a stay that’s fit for royalty. Before you set off for your private-island resort in Fiji — a place called Vatuvara — there’s the exertion of having to fill out a form. Before you arrive at your private-island resort in Fiji, to your villa with its own plunge pool and views of one of the most magnificent oceanscapes you’ve ever laid eyes on, the resort staff would also like to know how they can help you attain your wellness goals, and what activities you enjoy. You can check hiking and watersports, massages (plural! ), and renewing your vows, among other options. If you pick yoga, an on-call instructor named Cloud will be flown in by seaplane to help turn your tense, inflexible body into a warm pretzel. And here’s the thing. As you strike your wobbly tree pose to the lovely encouragement of Cloud, while gazing upon the aquamarine waters of the South Pacific, personal wine fridge stocked and ready, you will ask yourself some very important questions: If Fiji itself is supposed to be paradise, could it be that I’m experiencing something more than paradise? This villa, this view, this moment — is this paradise plus one? Paradise turned up to 11? These questions, which at the time will seem the most reasonable in the world, will lead you to reconsider the meaning of that well-worn word paradise — what it is and what it signals in our minds. It’s a common trope of travel, of course, used to imply a certain color of water, a certain softness of sand, a certain amount of sun and spoiling. But if you were to experience three distinct interpretations of the word, by visiting three lavish private-island resorts purpose-built to indulge your every desire, would each one expand or diminish the definition of paradise? And having experienced those dreams, what would you have learned? That’s why I went to Fiji, to find out. The beach at Six Senses Fiji. Located somewhere northwest of Tonga and southwest of Samoa, Fiji is a gorgeous insanity of South Pacific islands and atolls — more than 300, to be less than exact (some come and go with the tides). Though tourism is now the number one industry, for a long time Fiji was seen as Tahiti’s less exclusive cousin, with great beaches and diving but not much in the way of cushy, high-end resorts. Whereas honeymooners jetted to, say, Bora-Bora for their once-in-a-lifetime trip, backpackers would arrive in Fiji and board a ferry to one pristine island or another to surf, catch rays, and party on the beach. Some Australians came for family vacations, but Americans were far more likely to opt for Hawaii or the Caribbean. Over the past five years or so, though, the number of big-spending U.S. visitors has surged, thanks to the launch of nonstop flights from L.A. and a clutch of new upscale resorts. My wife, Sara; our youngest son, 13-year-old Nicholas; and I flew in from Boston, meaning our flight was a little less than nonstop. After almost 20 hours of air travel, we emerged into fragrant, humid air, stripping off our fleeces. A short car ride later, we came to a marina where a boat took us out into the watery playing fields of Fiji. To suddenly find ourselves in that elemental otherworld, with its salt-laced wind, expanses of fluorescent water, and rugged, mountain-fringed horizon, was discombobulating, a physical shock. It felt like the best kind of freedom in the world. On the transfer to our first resort, the newly opened Six Senses Fiji on Malolo Island, I chatted with Sam, a member of the crew, up in the front of the boat. After pointing out the various world-class surf breaks we passed by, Sam told me a story about Dakuwaqa, the shark god. He said Dakuwaqa once terrorized the waters of Fiji, but then when he attacked the island of Kadavu, a goddess named Rokobakaniceva, assuming octopus form, subdued the shark and extracted a promise that he would leave the people of Kadavu alone. Sam told the story as if it had occurred yesterday. Then, as we approached Malolo Island, he said that the island’s Tui Lawa, or chief, commanded his own duo of large sharks. If you misbehave, he said gravely, you might get bitten by one. When I asked if he really believed that, he looked at me, smiling, and said, “Of course.” He said his uncle had often swum with sharks, and because he was such a fine person, had not been bitten once. That’s why. From left: The beach at Kokomo, located on the remote island of Yaukuve Levu; a staffer at Vatuvara, where guests have included Prince Harry and Meghan Markle. While Six Senses is of course luxurious, it also stresses sustainability. Efforts to reduce the resort’s carbon footprint can be felt at every turn — from the metal drinking straws and the Tesla battery–powered solar fields to the kitchen garden with its resident flock of chickens. According to Rose Kavanaugh, the property’s enthusiastic marketing exec, it is this philosophy, more than the spa facilities or the food (both of which were fantastic), that repeat customers at Six Senses’ other resorts give as the reason for their return. Perhaps, having burned the jet fuel to be there, some of us feel relief in knowing that a resort has our ecological back. And however eco-friendly Six Senses’ version of paradise might have been, we certainly didn’t suffer for it. After checking in, we reviewed our activity options and found that they included a consultation with the property’s “sleep ambassador,” who can provide everything from organic pajamas to a sleep kit containing a neti pot and something called a sleep spritzer, infused with the scent of jasmine. Having installed ourselves in our beachfront villa, we took in the view. In the near distance, we could see a small island called Wadigi, which, we were told, has been rented out by Pink and Paris Hilton. Out to the west, the water turned from near-purple to an emerald green, and beyond that was an epic wall of white water where the energy of the ocean collided with the coral reef. Everything around us was shaped by the mood and aspect of the sea. 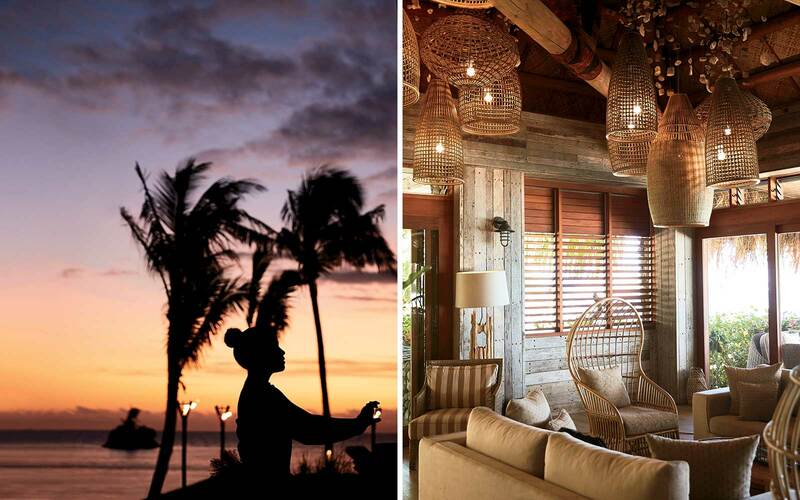 From left: At the Six Senses Fiji, traditional dance performances are held on the beach at dusk; the Beach Shack, the guest reception area at Kokomo Private Island, a recent addition to Fiji’s high-end resort scene. It occurred to me that part of what makes any place a paradise is the contrast it provides with your life at home. Back in Portland, Maine, where we live, Sara and I had just sent our oldest child off to college and put our second on a plane to Beijing for a high school year abroad. For the past few weeks, the nest had seemed two-thirds empty. In Fiji, the sensual bombardment of the natural world helped erase that parental pang. By the time we snorkeled the nearby reef, we’d passed into a state of wonder, lost in a world of parrotfish and blue starfish. It reminded me of something that came before all the swimming and paddleboarding, before the yoga and massage at the spa designed to look like a Fijian village, before our last night on the island and the cocktail on the hilltop overlooking the resort at sunset. When we’d first arrived, we’d met what Six Senses called our GEM, or guest experience maker. His name was Pela Rageci, and besides being awesome, he looked a little like Usher. His greeting to us that morning, later to be repeated by others, captured something so true about the familiarity we felt in Fiji. “Welcome home,” he’d said, as if we’d already been there in another life. If you ask me, the mega-rich have it the hardest in Fiji. The rest of us go on vacation, and then, with lightened wallets and heavy hearts, take our leave at the end of the trip. We don’t want to go home, of course, but we generally don’t have much choice. Multimillionaires, on the other hand, operate on a different budget and schedule. We all crave our own version of paradise, but they alone have the means to acquire it — as well as a seeming compulsion to engrave their indelible signatures on the landscape in golden glitter. And then the project turns out to be a whole lot of work. It’s a thing in Fiji, moguls and celebrities buying their own islands. Mel Gibson purchased one for $15 million. Clare Bronfman, the Seagram heiress, owns 80 percent of one, for which she paid $47 million. David Gilmour, the Canadian gold baron, bought and developed the 1990s granddaddy of Fiji’s star-studded private island resorts, the Wakaya Club & Spa. And in 2018, Red Bull cofounder Dietrich Mateschitz opened a resort on Laucala, his own manicured version of Xanadu, replete with Austrian chefs and an 18-hole golf course staffed by PGA professionals, which has attracted celebrities from Oprah Winfrey to George Clooney. So it was strictly in the name of research that we hopped aboard a seaplane whose barefoot pilot brought us to an island called Yaukuve Levu, which is owned by Australian real estate billionaire Lang Walker. 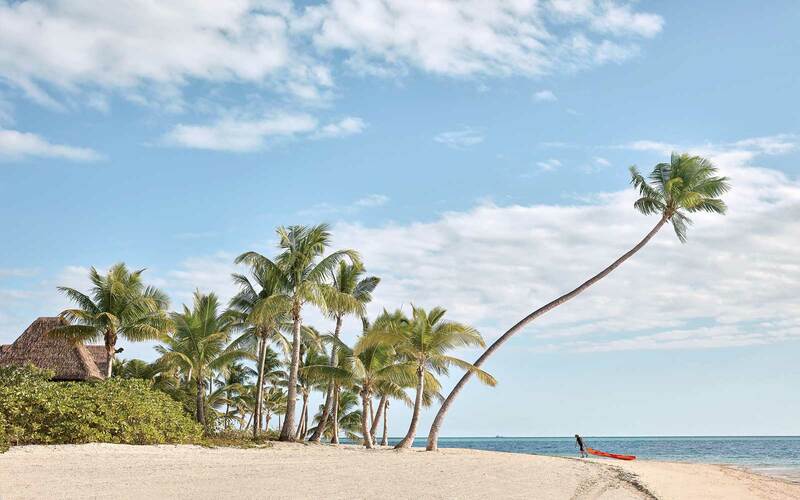 After spending $160 million, Walker has realized his own version of paradise: Kokomo Private Island. The story of its acquisition goes like this. In 2011, a friend sailed by the jungle-thicketed island that would become home to Kokomo, and told Walker he’d found just the place for him. Lore has it that when Walker eventually showed up, he slashed his way to the top of a hill to get cell coverage, then negotiated the price down from $7 million to $3 million. He calls it the most costly phone call of his life, because shortly thereafter, he turned on the cash spigot to create the resort that stood before us. “This is the one project on which Walker has truly spared no expense,” Martin Persson, the island’s GM, told me. Our beachfront villa, one of 21 at the resort, was once again ridiculous, with its white stone bathtub that resembled a bisected dinosaur egg, its bed that I never wanted to leave, oriented toward the azure ocean, and its paintings produced by one of Walker’s favorite painters, Chris Kenyon, during a yearlong island residency. But despite the creature comforts, at Kokomo you really get the feeling of being out there. The resort is situated in the Kadavu group of islands, surrounded by the Great Astrolabe Reef—the fourth largest on the planet — which teems with exotic marine life, including sharks and dolphinfish. The place feels so remote, in fact, that some of the nearby beaches are used to film international editions of Survivor. 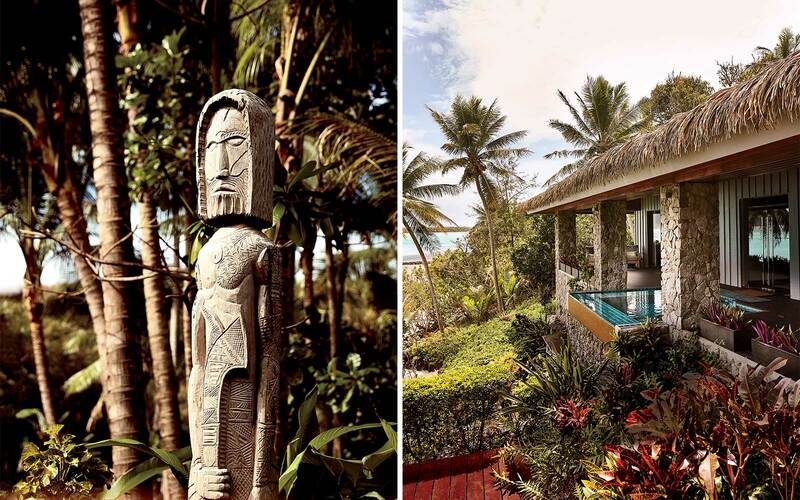 From left: Sculptures in the gardens at Kokomo were carved from fallen cinnamon trees; one of the three villas at Vatuvara, which all have an informal, personal feel. At Kokomo, we again were briefed about the multitude of on-land amenities on offer, from the tennis court to the yoga sessions. But again, we found ourselves most drawn to the aquatic wonderland of the Pacific Ocean. The resort offers a PADI dive center and a staff marine biologist who studies the region’s manta ray population. There’s Hobie catamaran sailing, tubing, snorkeling, outer-reef surfing, and deep-sea fishing (migrating tuna are never fattier than when in their Fiji phase, Persson told us). One day, we took a boat to an even more remote island, which took us past the Survivor beaches, where we could see a crew setting up one of the challenges. A short hike later, we found ourselves at the base of a 100-foot waterfall, a lovely refuge in the jungle with parrots fluttering by. Thinking ourselves brave, Nicholas and I clambered up some dry rocks and jumped. But then our Fijian guide climbed the slick rock-face behind the waterfall, found his own perch about halfway up, and casually dived headfirst into dark waters, splashing and whooping when he came up. When it came time to eat, everything was fresh and delicious — no small feat on a remote island. Kokomo’s ingredients come, in large part, from the farm on the eastern side of the island. These are overseen by Aussie executive chef Anthony Healey, whose previous gig was at Laucala and who also keeps bees for honey and presides over his own coterie of chickens. That evening, jellied by an excellent massage at what Kokomo touts as “the biggest spa in Fiji” — a still-modest collection of traditional thatched huts, where a hammam and a 3½-hour treatment called the Island Revival Journey are available — we ate at Walker d’Plank, one of the three restaurants at the resort. 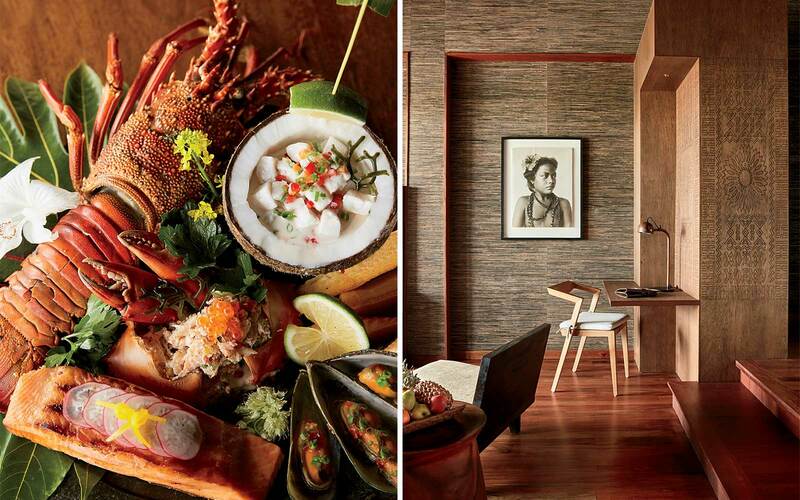 From left: The seafood platter at Vatuvara Private Islands showcases Fijian flavors like coconut, lime, and cilantro; a guest room at Six Senses Fiji. Seated on a deck over the rising tide, with crabs scuttling in the dark beneath us, we were welcomed by the restaurant’s chef, Caroline Oakley, a voluble local originally hired as Lang Walker’s private cook. It is her contagious belief that making food is an emotional act. Luckily for guests at Kokomo, she’s also an accomplished improviser (we all loved the resort’s willingness to cook off-menu). Soon came duck pancakes, Korean barbecue, and fried rice with lobster, all accompanied by wine from an extensive list. As I entered a food coma, my wife took up my reporter’s notebook to record my reaction. Our last stop was Vatuvara Private Islands, another billionaire-owned island nirvana and the place we met Cloud, the aforementioned yoga instructor. This time we came skimming via twin-engine from south to north, in the direction of the yet more remote Lau island chain, once closed to tourists, where Vatuvara is located. The resort is actually located on Kaibu — one of three islands owned by Jim Jannard, the American founder of Oakley sunglasses. It looks out on his beloved Vatuvara island, which remains a protected sanctuary. With three villas in the whole resort, and the other two unoccupied that week, we were the only guests being attended to by a staff of 42. Of course, our digs were stunning, but the vibe was more like someone’s cool home than a luxury resort, fully furnished with an outdoor shower, interesting books, and found art objects. Yes, the personal wine fridge was stocked, and a beautiful coconut cake sat on the counter, made in our honor. The beach was there for us alone, with all the toys (including a motorized sea scooter you could ride against the current). Cloud was on call, ready to pretzel us up. The ionized plunge pool was deep and temperature-controlled, and you could hang on the wall, gawking at the waves as they crashed against the barrier reef in the near distance. None of this should have been surprising — though it was! — once we learned a little about the man in charge, Rob Miller. Born in Australia and raised in Fiji, Miller is locally famous for having been the GM at the Wakaya Club & Spa in its late-90s heyday. 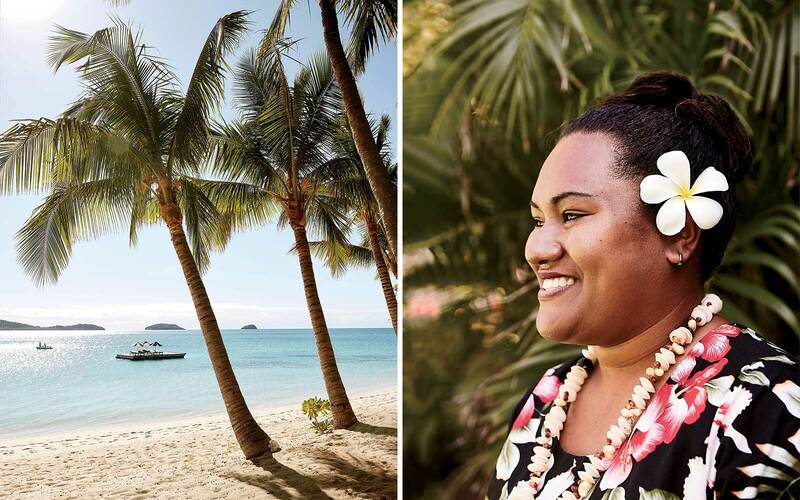 He is still regarded as something of the grand pooh-bah of Fijian hospitality — so much so that when Prince Harry and Meghan Markle had a night off on their recent tour of Oceania, Miller hosted them at Vatuvara. “Rob is a masterpiece,” said a woman named Leba Raluve, who acted as our server, bartender, masseuse, guest relations liaison, and probably about a dozen other things. Back when Miller was still working at Wakaya, hobnobbing with its famous clientele and perfecting the art of keeping them happy, he became particularly close to Jannard, then worth over $2 billion. So when Jannard bought these islands in 2009, he installed his friend Miller to build two houses on the 370-acre Kaibu island — one for each of them — and start something Miller described as “small and exclusive.” The two then collaborated on the addition of a runway, villas, and a four-hole golf course. When we visited, the resort had been in development for eight years, and they weren’t yet done with the gym. Theirs, Miller said, had been a soft opening. As an exclusive-use property, the time line of the launch was flexible. “We’re only looking for one booking at a time,” he explained. The resort itself felt like a family affair. Miller’s wife, Lynda, tends the gardens; his son-in-law, John, flies planes for the resort and handles all the water activities, from Jet Skiing to deep-sea fishing. Daughter Katy, a marine biologist, heads up the Vatuvara Foundation, which is charged with protecting the ocean life of the northern Lau islands. These days, there is much discussion about the effects of climate change, development, and tourism, which include the destruction of coral reefs, deforestation, and unsustainable fishing practices. In response, the foundation, in partnership with organizations including the U.S. Geological Survey, has studied the coral reefs and the wildlife sanctuary of Vatuvara island, hoping to protect the species that reside there — one of which is the coconut crab, the world’s largest land-based arthropod. With our time ticking down in Fiji, everything at Vatuvara assumed a special poignancy. The kokoda (Fijian ceviche) was somehow more flavorful; the perfume of the frangipani flowers more intense. 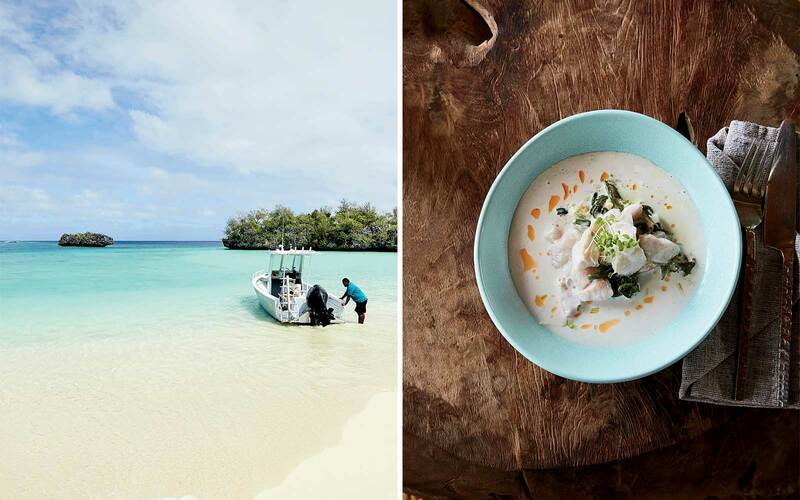 From left: Guests at Vatuvara have the island’s supply of watersports equipment all to themselves; kokoda, or Fijian-style ceviche made with coconut milk, at Six Senses. Before the long trip home, before the final goodbye song, we wanted one last adventure. So John fired up the Jet Skis and we set out to a secluded beach so we could snorkel on the coral reef one last time. “Yippity-yoppity!” Nicholas yelled, gunning the machine as I clutched his waist. It was his catchall phrase, and at that moment he delivered it with such joy I imagined his two siblings, wherever they were in the world, perking up at the resounding echo of familial happiness. Underwater, the reef dropped off suddenly, deeply — craggy and profound in its pinks and yellows and fluorescent blues. A sea turtle came winging along, its humble home on its back. Underwater, it flew. John, not us, saw it disappear in the distance. We simply imagined it, free to explore its own paradise and the feeling of its propulsion through all those awesome kingdoms of coral beneath the surface of our world. 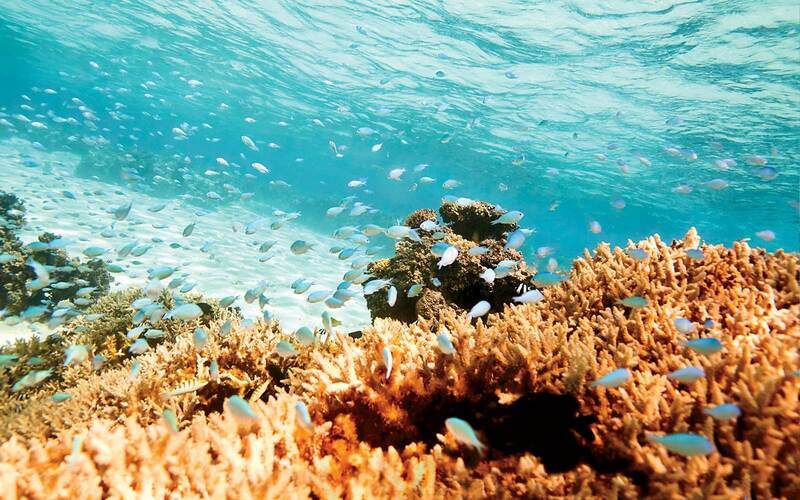 Vatuvara has set up a foundation to protect the surrounding reefs. You’ll want to set aside at least a week for a vacation here, as the journey can be long. But with beaches, reefs, and resorts like these, who would want to go for any less? Fiji Airways has daily nonstop flights from Los Angeles to Nadi International Airport, on the main island of Viti Levu. As Fiji is made up of more than 300 islands, many resorts offer their own air or boat transfers; in addition, there are ferry services to the busier Mamanuca and Yasawa island groups from Port Denarau, a short drive from the airport. Located on Malolo Island in the Mamanucas, this eco-friendly resort offers high-end luxury with minimal guilt — as well as excellent food and a dazzling array of wellness options. And for surfers of means, legendary spots like Cloudbreak and Restaurants are a short boat ride away. sixsenses.com; villas from $945. A 40-minute seaplane (or helicopter) ride south from Nadi to Yaukuve Levu, this property owned by Australian developer Lang Walker feels a bit like Fantasy Island. Whatever you want, the staff here aims to provide — from a picnic lunch on a deserted island to a visit to the Great Astrolabe Reef, one of the premier diving spots on earth. kokomo​islandfiji.com; villas from $2,500. Another plane ride, this time 40 minutes northeast from Nadi, lands you on Kaibu, an island in the remote Lau archipelago owned by Oakley sunglasses founder Jim Jannard. Formerly closed to tourists, Kaibu is now home to this exclusive, 370-acre, three-villa property with overflowing gardens, an on-site farm, and an organic golf course. vatuvara.com; villas from $4,300. Accessible by plane or road from Nadi, Nanuku is a laid-back, family-oriented resort in Pacific Harbour, on Viti Levu’s southern shore. Adventure is a central focus: guests can dive with sharks, Jet Ski to remote islands, and journey up inland rivers to rapids and waterfalls. What makes Nanuku most special, though, is the way it showcases Fijian culture — best witnessed in the traditional kava ceremony, which combines consumption of the euphoria-inducing local drink with tribal dancing and singing. auberge​resorts.com; doubles from $775.